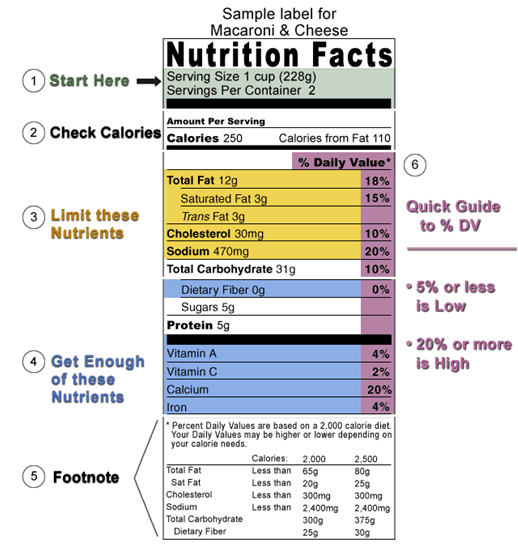 The Nutrition Facts label is found on food and beverage packaging. It can tell you many things about the food product like how many calories are in a serving, how much fiber the food provides, or what ingredients were used to make the product. Everyone is going to pay attention to different parts of the food label depending on what their health goals are. For example, if you are looking to lose or maintain your current weight, you may pay more attention to the calories listed on the label. If you are concerned with sugar content of food, you will pay attention to the grams of sugar listed under carbohydrates, as well as the ingredient list. Look at the serving size. Does the package contain more than one serving? Cross check the nutrition facts with the ingredient list. Food that have less than 1 gram of trans fat per serving can list that the product contains zero trans fats. Be sure to then read the ingredient list looking for items that have hydrogenated oils. This is common for bakery items and those that aim to have long shelve lives. It is best to stick with foods that have a short ingredient list. Look for the word “whole” before any grains listed in the ingredients. For example, look for “whole grain oats” not just “oats”. You can also look for at least 2 grams of fiber per serving for a product to be considered a significant amount. Use the Nutrition Facts label and ingredients list to limit foods and beverages that are high in sodium, saturated fat and added sugars.